Here is my Comi-Con 2012 interview! I had such a wonderful time on the Red Carpet yesterday at the Comi Con Fandango event. 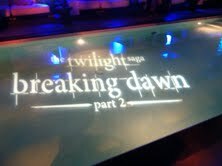 Before the Red Carpet I got to meet with so many fans for The Twilgiht Breaking Dawn Part 2. They finally got to meet Toshiro! The Lone Wolf! I am so happy to of met so many new fans! Appreciation for my wife, Summit Entertainment, and Fandango!